Week 3 was the BIG day for the first Photo shoot. I had put an awful lot of time and effort into this and not really had exactly what I had wanted which was still niggling me…..yeh yeh yeh!! I can hear you. Leave it behind and move on but I am and have always been like this. Blog 2 (5 hours around Manchester states what I wanted). I called in at a friends Boutique and there in the window was a beautiful Kimono which is very Oriental. Paul Poiret brought this from his travels in the 20s. You will see them in the shops now as the 1920s is big this year. If you want one I have just found this beauty at ASOS in the SALE…YIPPEEE for just £16. Follow the Link below. Anyway it was a long day. Been on loads of photo shoots over the years with working with’BucksFizz’ and as a Solo artist. In fact been in the very same building for some of our shoots. The weird thing is when speaking to my Mum I realised that I had styled those shoots all those years ago and hadn’t really realised it. You may remember the Black PVC and the tops coming off instead of the Skirts for’ Making Your Mind UP’. That was my idea!!!! I thought it was great at the time but sometimes we all look back in horror at our ideas…Yikes! Anyway I digress. My teachers and I had decided on Palazzo pants and no shoes with the Kimono. When I got to the shoot, the model….very beautiful….was a little smaller than I had expected and so I decided to loose the pants, (they would completely drown her) go with Black underwear and grabbed my shoes that I carry for work from my car. Good job she was my size feet hey!! I was the last up and Natalia (Model) was very tired (which is understandable) and someone has to go last…so hey ho. I will show you the shoot when we have the finished article. I am sooooo picky and too hard on myself. I still think it could have been better. 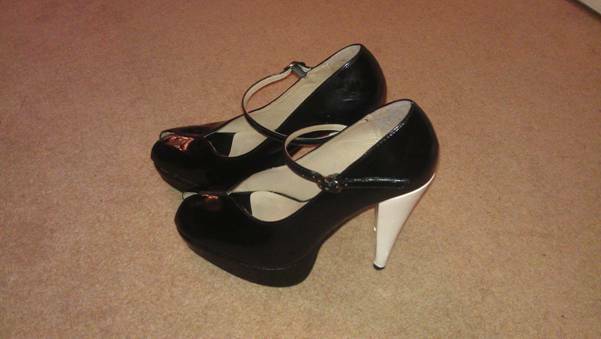 ‘KILLER SHOES’ a play on words. 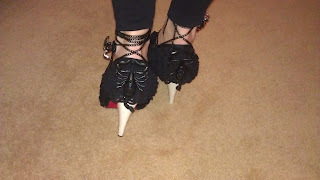 It’s what us girls call heels when they are high and these have a spider and a scorpion on them…..Love it!! Oh by the way for the top I customised in the last blog I got an ‘A’. Well chuffed! !